​Here are a number of links to articles on shamanism in Korea and other East Asian cultures. Click on each title to open the document. Theories of Disease: Shamanistic Healing Rituals in Korea, by Tae-han Hong (nd). Blacker, Carmen (1999). The Catalpa Bow: A Study of Shamanistic Practices in Japan. London: Routledge. Bruno, Antonetta L. (2002). The Gate of Words: Language in the Rituals of Korean Shamans. Leiden, The Netherlands: Research School of Asian, African, and Amerindian Studies (CNWS), Universiteit Leiden. Cho, Hung-youn (1999). Cultural Interbreeding between Korean Shamanism and Imported Religions. Diogenes 47(3): 50-61. Choi, Chongmoo (1989). The Artistry and Ritual Aesthetics of Urban Korean Shamans. Journal of Ritual Studies 3(2): 235-49. Ch'oe, Kilsǒng (1984). Male and Female in Korean Folk Belief. Asian Folklore Studies. 43(2):227-233. Choe, Chun-sik (2006). Folk-religion: The Customs in Korea. Seoul: Ewha Womans University Press. Covell, Alan Carter (1993 3rd ed.) Folk Art and Magic: Shamanism in Korea. Elizabeth, NJ: Hollym International Corporation. Covell, Alan Carter (1984). Shamanist Folk Painting: Korea's Eternal Spirits. Elizabeth, NJ: Hollym International. Deutsch, Lauren W. (1993). Meeting with Sanshin: An Interview with Hiah Park, Lover of the Mountain God. Kyoto Journal, vol. 25. Deutsch, Lauren W.(ed.) (2009). Korean Shaman Art. Korea Art Society Newsletter, Vol. 1, no. 1: 3-46. Deutsch, Lauren W. (2009) Don’t Buy the “Buddha”! An Overview of Collecting Korean Shaman Paraphernalia. Korean Art Society Newsletter. 1 (1): 23-28. Grayson, James Huntly (1992). The Accommodation of Korean Folk Religion to the Religious Forms of Buddhism: An Example of Reverse Syncretism. Asian Folklore Studies Vol. 51, No. 2 (1992), pp. 199-217. Grayson, James H. (1996). Female Mountain Spirits in Korea: A Neglected Tradition. Asian Folklore Studies, Volume 55: 119-134. Grayson, James H. (1998). Sŏngha Sindang: The Tutelary Shrine of T'aeha Village, Ullŭng Island, Korea. Asian Folklore Studies. 57(2):275-291. Grim, John A. (1984). Chaesu Kut: A Korean Shamanistic Performance. Asian Folklore Studies. 43(2):235-259. Guisso, Richard W. I. (1988). Shamanism: The Spirit World of Korea (Studies in Korean Religions and Culture, 1). Fremont, CA: Jain Pub Co.
Harvey, Youngsook Kim (1979). Six Korean Women: The Socialization of Shamans (American Ethnological Society Monographs). West Group Publishing. Hogarth, Hyun-key Kim (1999). Korean Shamanism and Cultural Nationalism. Jimoondang Pub. Co.
Howard, Keith (1991). Paper Symbols in Chindo "Ssikkim Kut": a Korean Shamanistic Ceremony. Cahiers d'Extrême-Asie (1991) Vol. 6, pp. 65-86. Howard, Keith (Editor) (1998). Korean Shamanism: Revivals, Survivals, and Change. The Royal Asiatic Society, Korea Branch, Seoul Press. Huhm, Halla (1980). Kut: Korean Shamanistic Rituals. Weatherhill. Hwang, Merose (2007). “The Mudang: The Colonial Legacies of Korean Shamanism”. In Han Kut: Critical Art and Writing by Korean Canadian Women, edited by The Korean Canadian Women's Anthology Collective. Pp 103-119. Im, Sok-Chae (Editor), Alan C. Heyman (Editor) (2003). Mu-Ga: The Ritual Songs of the Korean Mudangs. Fremont, CA: Asian Humanities Press. Jang, Nam-hyuck (2000). Shamanism In Korean Christianity(Korean Studies Dissertation Series No. 4). Seoul: Jinmoodang International. Kendall, Laurel (1984). Korean Shamanism: Women's Rites and a Chinese Comparison. Senri Ethnological Studies 11: 57-73. Kendall, Laurel (1985). Shamans, Housewives, and Other Restless Spirits. (Study of the East Asian Institute) Honolulu, HI: University of Hawaii Press. Kendall, Laurel (1988). Life and Hard Times of a Korean Shaman: Of Tales and the Telling of Tales. Honolulu, HI: University of Hawaii Press. Kendall, Laurel (1996). Korean Shamans and the Spirits of Capitalism. American Anthropologist 98 (3): 512-527. Kendall, Laurel (2008). Of hungry ghosts and other matters of consumption in the Republic of Korea: The commodity becomes a ritual prop. American Ethnologist, 35(1): 154-170. Kendall, Laurel (2010). Shamans, Nostalgias, and the IMF: South Korean Popular Religion in Motion. Honolulu, HI: University of Hawaii Press. Kendall, Laurel, and Jongsung Yang (2015). What is an Animated Image? Korean Shaman Paintings as Objects of Ambiguity. Hau: Journal of Ethnographic Theory 5 (2): 153-175. Kendall, Laurel, Jongsung Yang, Yeolsu Yoon (2015), God Pictures in Korean Contexts: The Ownership and Meaning of Shaman Paintings. Honolulu: University of Hawaii Press. Kim, Chongho (2003). Korean Shamanism: The Cultural Paradox. (Vitality of Indigenous Religions Series). Ashgate Publishing. Kim, David J. (2013). Critical Mediations: Haewŏn Chinhon Kut, a Shamanic Ritual for Korean Comfort Women. Positions: East Asia Cultures Critique, Volume 21, Number 3, Summer 2013, pp. 725-754. Kim, David J. (2015). Visions and Stones: Spirit Matters and the Charm of Small Things in South Korean Shamanic Rock Divination. Anthropology and Humanism, 40 (1): 1–19. Kim, Jin-Young & Young-Gun Ko (2011). Korean Shamans and Childhood Trauma. The Journal of Psychohistory 39 (1): 41-49. Kim, Seong-nae (2004). Shamanic Epics and Narrative Construction of Identity on Cheju Island, Asian Folklore Studies, Volume 63: 57-78. Kim, Tae-gon (1988). Regional characteristics of Korean shamanism. In Yu, Chai-shin & Guisso, R. (eds. ), Shamanism. The spirit world of Korea. Berkeley, California: Asian Humanities Press, 119-130. Kim, Tae-kon (1998). Korean Shamanism: Muism. Jinmoondang International. Kister, Daniel A. (1995). Dramatic Characteristics of Korean Shaman Ritual. Shaman Vol 3, no. 1-2, pp. 33-60. Kister, Daniel A. (2006). Korean Shamanist Ritual: Symbols and Dramas of Transformation. Fremont, CA: Jain Pub Co.
Koudela, Pál & Yoo, Jinil. (2016). 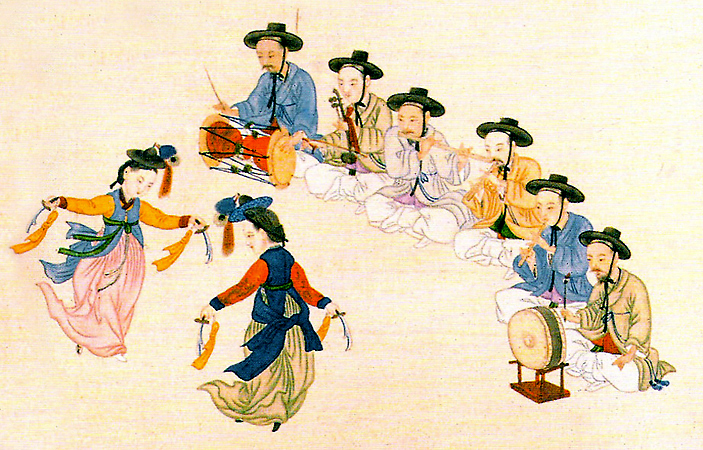 Music and Musicians in Kut, the Korean Shamanic Ritual. Revista de etnografie şi folclor (Bucureşti) [Journal of ethnography and folklore]. 1-2: 87-106. Lee, Jung Young (1973). The Seasonal Rituals of Korean Shamanism. History of Religions 12(3): 271-287. Lee, Jung Young (1973). Concerning the Origin and Formation of Korean Shamanism. Numen, Vol. 20, Fasc. 2 (Aug., 1973), pp. 135-159. Lee, Jung Young (1981). Korean Shamanist Rituals. The Hague, Netherlands: Mouton Publishers. Lee, Kun Jong (2004). Princess Pari in Nora Okja Keller's Comfort Woman. Positions – Asia Critique 12 (2): 431-456. Lee, Nami, and Kim, Eun-Young (2017). A Shamanic Korean Ritual for Transforming Death and Sickness into Rebirth and Integration. International Journal of Humanities and Social Science 7(5): 75-80. Mason, David (1999). Spirit of the Mountains: Korea’s Sanshin and Traditions of Mountain-Worship. Elizabeth, NJ: Hollym. McBride, Richard (2006). What Is the Ancient Korean Religion? Act Koreana 9(2): 1-30. Mecsi, Beatrix (2010). Dokseong: Korea's Mysterious Lonely Saint. Mélanges Offerts à Marc Orange et Alexandre Guillemoz. Cahiers d’Études Coréennes8: 357-365. Paris: Institut d’Études Coréennes, Collège de France (ISSN 0769-7295). Mills, Simon (2012). Sounds to soothe the soul: music and bereavement in a traditional South Korean death ritual. Mortality 17(2): 145-157. Oak, Sung-deuk (2010). Healing and Exorcism - Christian Encounters with Shamanism in Early Modern Korea. Asian Ethnology 69(I): 95-128. Park, Jecheol (2017). Korean Shamanic Experience in the Age of Digital Intermediality: Park Chan-kyong’s Manshin. Concentric: Literary and Cultural Studies 43 (2): 107-132. Park, Jun Hwan (2012). "Money is the Filial Child. But, at the same time, it is also the Enemy! ": Korean Shamanic Rituals for Luck and Fortune. Journal of Korean Religions Volume 3, Number 2, pp. 39-72. Park, Thomas G. (2017). Why the sponsorship of Korean shamanic healing rituals is best explained by the clients’ ostensible reasons. European Journal for Philosophy of Religion 9(3): 1-24. Rhi, Bou-Young (1993). “The Phenomenology and Psychology of Korean Shamanism.” In Guttorm Fløistad (ed. ), Asian Philosophy, vol. 7, pp. 253-268. Dordrecht & Boston: Kluwer Academic Publishers. Sarfati, Liora (2016). Shifting Agencies through New Media: New Social Statuses for Female South Korean Shamans. Journal of Korean Studies 21(1): 179-211. Schlotttmann, Dirk (2013). Cyber Shamanism in South Korea. 사이버사회문화 (Journal of Cyber Society & Culture) 4(2): 29-61. Schlottmann, Dirk (2018). Spirit Possession in Korean Shaman Rituals of the Hwanghaedo Tradition. Journal for the Study of Religious Experience 4: 3-23. Synott, John (2010). The Spirit of the Mountains: Korea's San-Shin and Traditions of Mountain Worship Acta Koreana. 13(2): 199-205. Tran, Tommy (2018) Acquired Tastes: Urban Impacts on Jeju Shamanic Ritual. The Review of Korean Studies Volume 21 Number 1 (December 2018): 93-124. Walraven, Boudewijn (1983). Korean Shamanism (Review Article). Numen 30(2): 240-264. Walraven, Boudewijn (1994). Songs of the Shaman. London: Routledge. Walraven, Boudewijn (2001). “Opening the Gate of Writing: Literate Shamans in Modern Korea”. In The Concept of Shamanism: Uses and Abuses, ed. by Henri P. Francfort, Roberte Hamayon, and Paul G. Bahn, 331–348. Budapest: Akadémiai Kiadó. Walraven, Boudewijn (2002). “Weavers of Ritual: How Shamans Achieve Their Aims”. The Review of Korean Studies, Vol 5 no. 1: 85–104. Yi, Kris Yongmi (2000). Shin-byung (divine illness) in a Korean woman. Culture, Medicine and Psychiatry, 24(4): 471-486.